The chimney cap fits over the flues and is secured to the crown of the chimney. 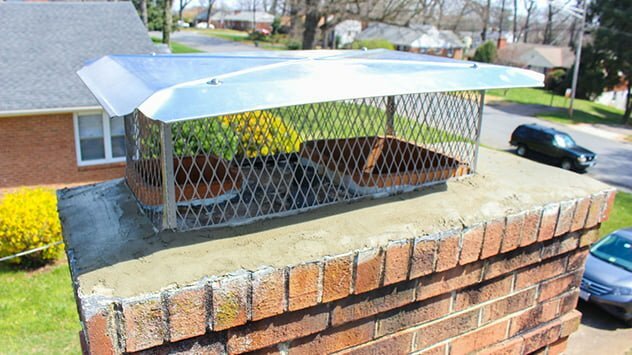 Installing a chimney cap can help to prevent mold, mildew and moisture from damaging your home, while the mesh cage reduces fire hazards and keeps birds, squirrels and other animals out of the chimney. Before you purchase a chimney cap, measure the top of the chimney, also called the “crown,” as well as the individual flue, or flues, that will need to be covered. We have two flues here and it was a tight fit finding a cap with a footprint that was larger than the two openings combined, but smaller than the crown. After dry fitting the cap, remove any flaking mortar or sealant from the crown of the chimney. This style of cap is a hinged cage with flanges all around the base. Use a drill with a masonry bit to drill pilot holes into the concrete crown at several points along each side of the cage. Then drive masonry screws through the flange, into these holes to secure the cage to the crown. Attach the “roof” of the cap to the cage. In this case, there are four screws that secure the top in place. If the crown is in poor condition, mix some mortar to fill in the cracks. Use a trowel to spread the mortar over the surface, including the flange of the chimney cap. Sculpt the mortar so that it slopes down from the center of the crown in all directions. This will encourage water to roll off of the crown rather than puddling. Thanks for sharing this video, the way you installed this chimney cap is very inspiring. I really appreciate your step –by –step instructions that you have shown in this video. I think a certified professional can do this job in a very methodical way. A chimney cap is used to prevent rain, animals, and wind from entering the home and causing unwanted problems. Any homeowner can install a chimney cap. One important thing to remember when it comes to installing a chimney cap on your own is to remember to wear protective gloves! Nice work. These are all great suggestions.